It is convenient that our bbcode is updated and new services are supported automatically. If our BBCode doesn't support the needed audio service, we will be happy to add it. In this topic, please provide the URL of the page of the audio with the audio service you're interested in and the embed code. It will help us to add support of the service. If the new audio service is demanded we will soon add the support to our audio bbcode. 1. Admin panel, tab "Posting", page "BBCodes", add BBCode (if you already have a [audio] then delete it). guess, yes, you can play Ogg Vorbis/Opus/MP3/AAC files via BB [audio] if your browser supports it. Ok, buddy, thanks for answering. What am I doing wrong? Could you please help me? Yes, ЖЪРЧИК, I know that Please read existing replies before answering. I asked days ago to VEG if uploaded files can be played and he answered 'yes'. guess, apparently he did not understand the question, but play of attachments is possible only in a new tab-window browser. It is possible, in phpBBex is implemented without BBCode, with the help of a group of extensions added. For phpBB ready code no. But the return of investment in phpBB is implemented poorly, and creates a very high load on the server. guess wrote: I asked days ago to VEG if uploaded files can be played and he answered 'yes'. BB [media] can play uploaded files via direct link. 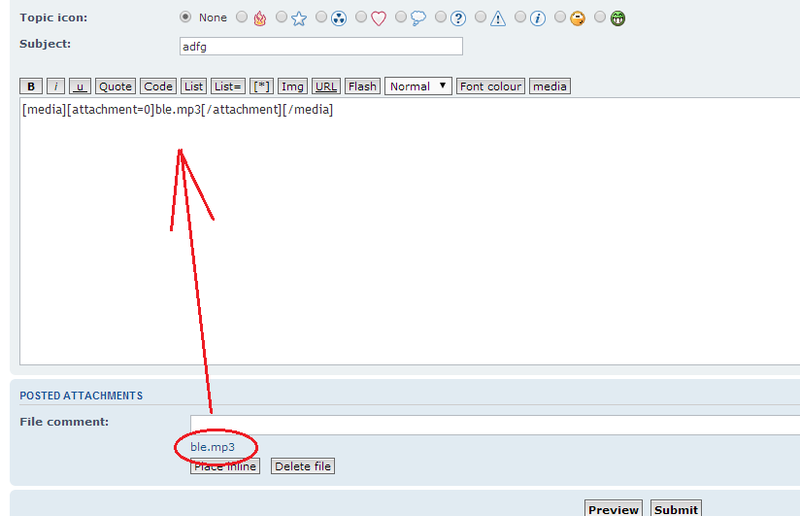 It means you have to upload file via FTP and use direct URL for BB [media]. BB [media] can't play files from attachments.